These Large Display Cabinets For Counter Exhibition Feature Four Levels and Sturdy Acrylic Construction! 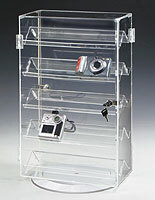 This Is A Popular Display Cabinet Model, Currently Available For Purchase In Our Large Online Inventory! 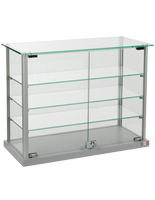 These display cabinets have a total measurement of 16"h x 22"w x 8.5"d, offering you a sizeable area for exhibiting your sellable merchandise. 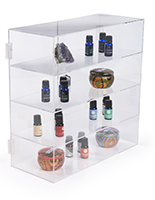 The acrylic cases have three shelves. Each shelf is 3 5/8" apart, giving you four platforms for smaller merchandise, like jewelry, watches, and anything else that will fit on the inside of the exhibit cases. 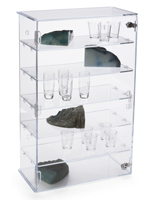 The Lucite composition of these display cabinets supplies a strength that isn't obtainable in conventional glass exhibit cases. This strength will enable long lived protection for your merchandise from dust and ruin. These countertop showcases, display cabinets will intermingle with a quantity of locations and venues, promoting your merchandise and helping to drive sales! 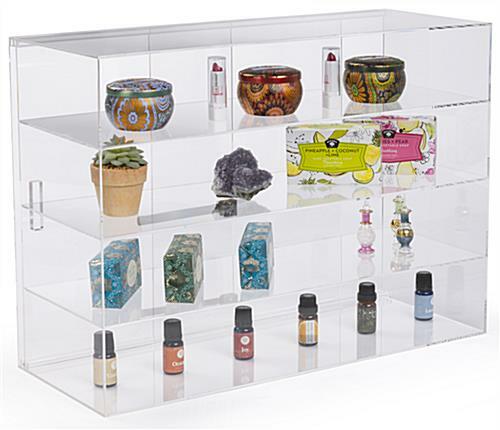 These Lucite exhibit cases will make any display look amazing, whether it's on a countertop at an event or on a glass topped floor cabinet in a small dress shop. 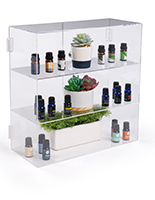 The durable but easy to carry Lucite composition means that these display cabinets are moveable and are usually quickly moved about to where the most clients will notice the contained merchandise. These extraordinary exhibit showcases utilize sliding doors (instead of the hinged doors provided on a number of our Lucite cases), which gives the display a big entryway for adding and taking out merchandise. The sliding doors can be fixed shut with a ratcheting style lock, and two keys are provided with each display cabinet. These countertop exhibit cases can be shown with the doors facing the employee or the clients, contingent upon your needs and the requirements of your shop. 32.0" x 16.0" x 8.5"